The aim of CICES is not to replace other classifications of ecosystem services but to enable people to move more easily between them and to understand more clearly how people are measuring and analyzing information. 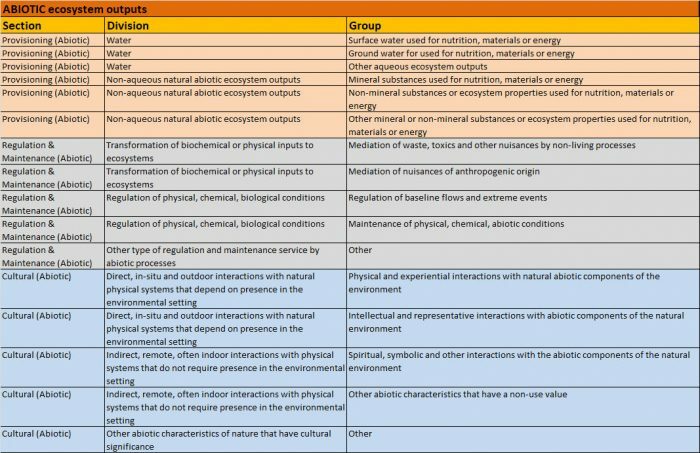 You can see the broad equivalences between CICES and the MA, TEEB and IPBES Classifications here. 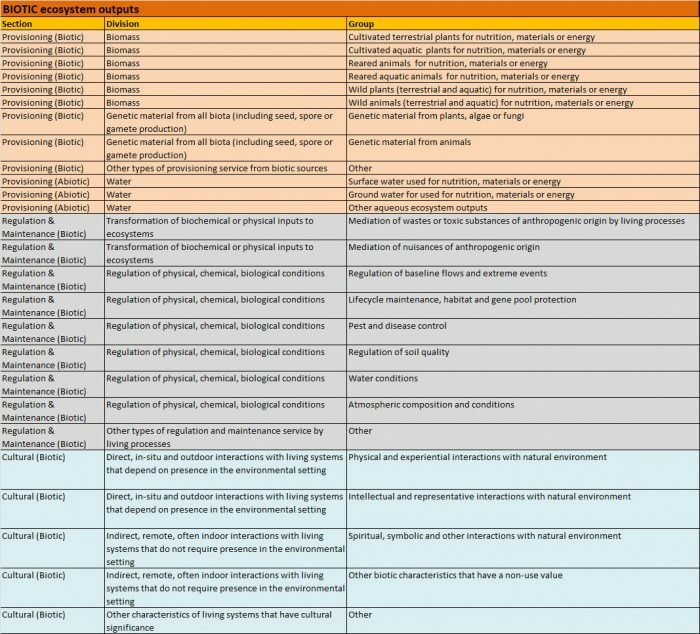 There is also a spreadsheet tool available that provides broad equivalences for the US-EPA Final Ecosystem Goods and Services Classification System (FEGS-CS). Following common usage, CICES recognises that the main categories of ecosystem outputs to be provisioning, regulating and cultural services. However, it does not cover the so-called ‘supporting services’ originally defined in the MA. Rather these supporting services are treated as part of the underlying structures, process and functions that characterise ecosystems. Since they are only indirectly consumed or used, and may simultaneously facilitate many ‘final outputs’, it was considered that they were best dealt with in environmental accounts and mapping in other ways. Note: water for illustration purposes to show consistency with V4.3, water is shown in both biotic and abiotic sections. In the formal classification table it is now part of the abiotic extension. The hierarchical structure of CICES is in line with United Nations Statistical Division (UNSD) best practice guidance. The first four levels can be used for ecosystem accounting, for example, without reducing the utility of the classification for different users, such as those concerned with mapping who may need more detailed categories. The new aggregation of provisioning services in Version 5.1 also takes account of accounting situations where the end-use of a crop, for example, is not known. Where this occurs the output can be recorded at, for example, Group level (e.g. Cultivated terrestrial plants for nutrition, materials or energy). The hierarchical structure is also designed to address issues of scale and accommodate geographical differences in what kinds of ecosystem output are recognised as a service. Thus the more aggregated Groups and Division categories may be used for reporting at broader spatial scales, where a number of the more specific classes are combined. At finer geographical scales, these broader categories of service might be represented by the specific classes that make sense at the local level. As with the previous version of CICES, the hierarchical structure of V5.1 allows further classes and classes types to be added as new applications emerge. The structure is therefore not intended to be exhaustive below class level. Rather it is intended as a framework that can develop and be adapted over time.